The Sierra Foothills are a fascinating wine area for me. Like most up-and-coming areas, its diversity of styles and varietals makes it hard to get a handle on. That same lack of focus is also what makes it a place that’s teeming with possibilities for experimentation. This is a place to explore and while most of the Syrah I’ve had from there are decidedly not cool-climate, this one looked intriguing. As you can imagine, this is not the type of answer you get from many winemakers these days. In a sense, it epitomizes the romantic idea that many of us who are not winemakers have about making wine but one that you rarely hear among UC Davis-educated winemakers who’s craft is firmly rooted in science and technology. Suffice to say, Beckmeyer takes a hands-off approach. This approach is what Alice Feiring and other proponents of the Natural Wines movement believe in because it gives you wines that are “outside the box” and unique in aroma, flavor, and even texture. The Sumu Kaw is fermented with native yeast, goes through whole cluster fermentation, which Beckmeyer believes tempers the often over-exuberant fruit in the Sierra Foothills with some acidity and complexity. The wine is crushed by foot. All in all, he’s making Syrah similar to how it was traditionally made in the Northern Rhone. Beckmeyer also believes in using only a small amount of sulfur to stabilize the wine before bottling. Many wineries add sulfur earlier in the process and add more at bottling to stabilize the wine, to prevent natural yeast fermentation, and in the vineyard even to protect the vines themselves from fungi. Natural wine-makers believe that too much sulfur doesn’t allow their wines to express their own uniqueness and therefore limits the wine’s expressiveness based on its terroir. The wine: On first smell, this wine had the unmistakable smell of pickle juice — not the most enticing aroma. Apparently, this is NOT a wine to pop and pour. I’m not sure if it’s because of the Natural Wine-making process or what, but this wine definitely needs some time to open up. I let the wine breathe and it began to develop more appetizing aromas; there are cherry and high-toned gravel aromas in this wine. Unfortunately though, I continued to get some other aromas that weren’t so appetizing, namely, Jaegermeister. Now, I don’t usually get Jaegermeister in wine but suffice to say, when I do, it’s generally not a wine that I like. I think the Jaegermeister aromas in the Sumu Kaw spring from a very present licorice aroma mixed with a presence of too much alcohol. Those gravel and stone aromas carry over to the mid-palate, which is round and sweet. The finish does have a fair amount of acidic lift. All in all though, that sweetness on the mid-palate is a too sweet and alcoholic for me. Granted, it’s not the oaky, cloying sweetness I would associate with many California wines but there’s a sweetness on the mid-palate that reminds me of liqueur and leaves an unpleasant aftertaste in my mouth. It’s not exactly what I would call varietally correct for Syrah and it’s a shame because this wine has some elements (the gravel aromas and acidity on the finish) that I would normally really like. Part of the problem I’m having could be is due the fact that there’s also 16% Mouvedre added to this wine. It’s hard for me to pick out the Northern Rhone characteristics that I would love to have seen in this wine because the Mouvedre might be masking them. Now, I like Mouvedre for its acidity and meaty aromas but something is a little off with this wine for me and it simply does not work together with the Syrah here. To be clear, I’m not sure if it’s the Natural Wine-making process that I’m just not used to, or if it’s the Mouvedre, but something just isn’t quite up to snuff for my palate. It’s an intriguing wine, but not quite up my alley. 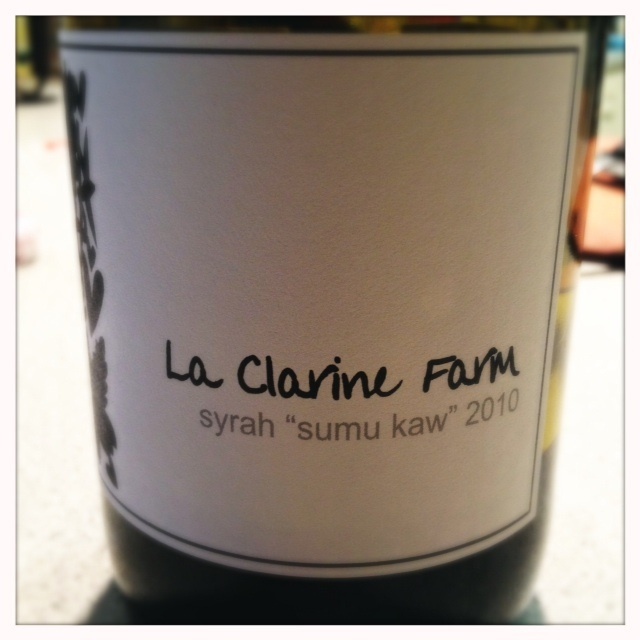 I hope in the future that the Sumu Kaw vineyard will produce Syrah that’s worthy of being its own 100% bottling. That’s a Syrah that I’ll be waiting in line to buy and revisit in hopes that my Natural Wine epiphany is simply yet to come. Hey Beau, I know you hate the use of “high toned” and I thought about you when I wrote it 🙂 I guess what I mean is that there was a combination of acidity and minerality that resulted in a bright aroma. It makes sense to me if you think of of it in terms similar to how people describe sound as bright but I’ll admit it’s imperfect.